Brussels sprouts are one of my favorite vegetables from early fall through late spring. They are hearty enough to substitute for a carb in a meal and take on almost any flavor profile. Most of the time when I make them I just roast them in the oven with salt and pepper and we are good to go. But last night, I felt like fancying things up, and here is what I made! A little sweetness from the raisins, a touch of Dijon mustard for some tang, and some fat and salt from the pine nuts and Parmesan. Still simple to make, but with a great combination of complementing flavors. Cut the brussels sprouts in half and put onto a cookie sheet. Toss with 2 tbs olive oil, Dijon mustard, and salt and pepper. I like when they are browned and crunchy after cooking, so place them cut side down on the cookie sheet in a single layer. Cook for 20 minutes. While the sprouts are cooking, heat a small saute pan on medium heat. Lightly toast the pine nuts (be careful not to burn!) until they are light brown. Remove from the pan and set aside. Add the raisins and red wine to the pan. Cook the raisins on medium heat until they have plumped up and absorbed most of the wine. Drain from the wine and set aside. When the sprouts have finished cooking, lay them on a serving dish. 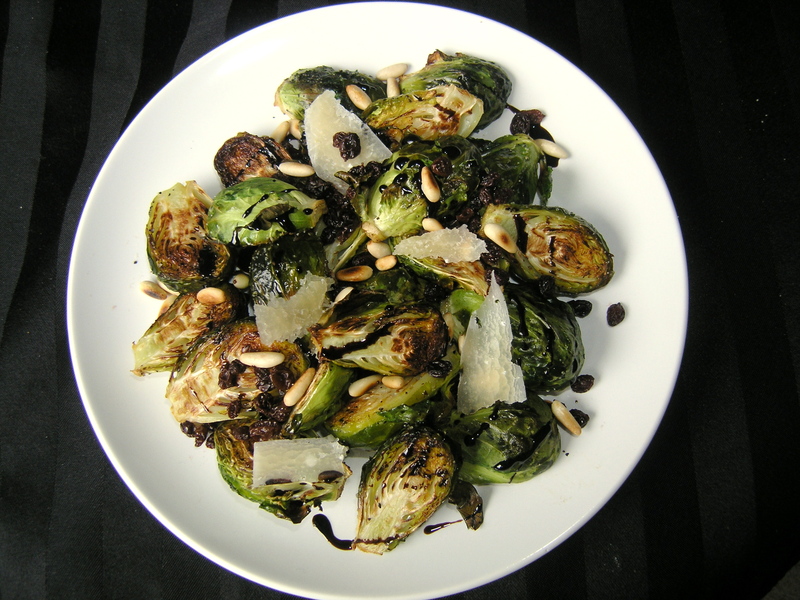 To achieve a similar plating scheme as pictured, sprinkle the balsamic, raisins, pine nuts, and then Parmesan on top of the sprouts in that order. Serve immediately.